In the past 9 months or so, I’ve turned into an anti-plastic vigilante. Of course, ever since I started grocery shopping for myself at 19, I brought my tote along and refused plastic bags. But in other ways, I had been resigned to living with plastic. What could I do when our society is pretty much built out of plastic? As with veganism, my decision to go minimal-plastic was made out of a personal reaction. I think I saw a photo of a hungry sea turtle eating a plastic bag, mistaking it for a jelly fish. Then there were the photos of birds’ stomachs filled with plastic bottle caps and junk. It’s strange how you may have seen something similar in the past, but one day you are traumatized enough to really take it personally. I was super upset and vowed to limit my personal responsibility in killing turtles, as much as humanly possible. Tip #12 in action in Rome! Since the invention of plastic, 8.3 billion metric tons have been created–and 6.3 billion metric tons have become plastic waste. Only 9% of that has been recycled. Much of the growth in plastic has been in packaging, which also has a useful lifespan of 5 minutes on average. Single-use plastic takes 5 seconds to make, and takes 500 years to break down. Hundreds of thousands of marine animals die every year from plastic ingestion–just check out Blue Planet II final episode showing an albatross chick eating a plastic toothpick. You cannot see this without your heart breaking. 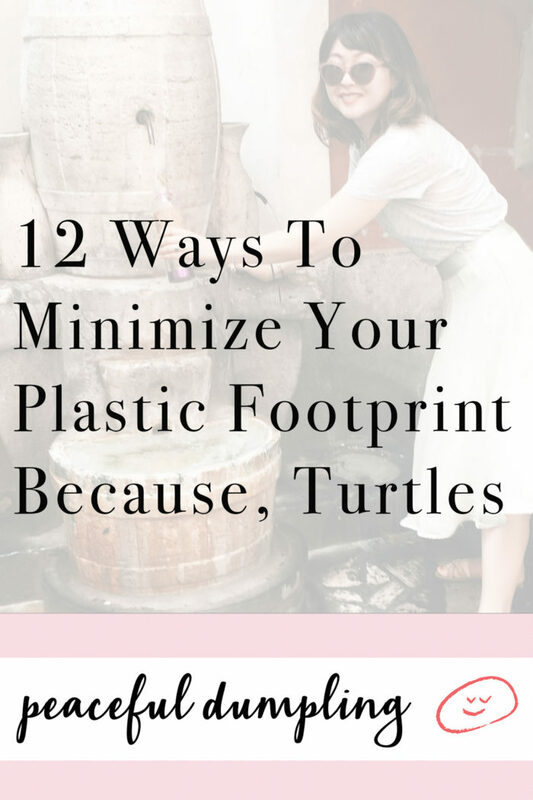 Fortunately, there are so many ways you can cut down on your plastic consumption. Here are some of my favorite ways that have helped me become minimal-plastic user. Put bulk vegetables in paper bags: In the U.S., default choice for putting things like mushrooms, green beans, Brussels sprouts, etc is a thin plastic bag. But most groceries have a small brown bags for putting things like hot soups, so take some from the soup aisle / bakery section or just ask the cashier. Bonus: Mushrooms stay fresher longer in paper. If they don’t provide paper bags, bring old plastic bags from home: This is what I do sometimes. Also great for things like quinoa, nuts, granola, etc! Use large paper bags to take out un-biodegradable trash: Even though I can easily bring my groceries home in my many, many totes, I always ask for paper bags at Whole Foods because I can use them for taking out the trash. I already create very minimal, dry waste due to composting so I just use the paper bag to take the waste to the apartment’s big garbage can, and then recycle the paper bag immediately. Look for biodegradable/compostable/recyclable packaging: Support brands that use recycled or biodegradable materials for packaging like Earthwise Beauty and Jovial Pasta (one of the best gluten-free pastas–I buy 1 every week!). The paper box is made of post-consumer recycled materials and the clear film is compostable. Plus this gluten-free pasta is one of the best I’ve had. Don’t buy stuff in plastic packaging: Most plastic you recycle actually doesn’t end up having a second life and ends up in landfills and the oceans anyway. The best way to reduce plastic waste is actually to cut consumption of things like bottled beverages, juices, yogurts, etc. I haven’t bought bottled juices or smoothies since last June and it’s really not a big deal! I *occasionally* still indulge in a coconut yogurt but that’s fairly rare. Obviously, don’t ask for plastic bags at stores: You’re probably already doing this! I sometimes run out of space in my tote and carry home a huge bundle of wet kale in my hand. Do I look silly? Yes. But that’s just 10 minutes of walking around–plastic bags are forever!! Recycle all the parts: Unscrew bottle caps from almond milk cartons, etc. While recycling isn’t all effective, it helps separate plastic from other waste at least–which in turn reduces its chances of ending up inside a baby bird’s stomach. Try to buy 100% natural fiber clothing: Look for organic cotton, linen, Tencel, bamboo, Cupro (I haven’t tried it but my friends say it’s amazing), etc. This is critical because most plastic in the oceans are actually microplastics invisible to the naked eye–and these come from our polyesters, nylons, and other synthetic textiles. When synthetic fibers are unavoidable, wash them less frequently: Your activewear or jeans will always involve some synthetics, for example. If you have clothes that don’t need to be washed after every single wear, focus on spot treating by hand as needed. Switch to biodegradable floss and toothbrush: Floss–so harmless and yet, made of nylons and likely to be mistaken for worms and other edibles to hungry birds. Turtles too. Your local organic store definitely has biodegradable floss and toothbrush. Bring your reusable bottle everywhere: Back to basics! How do you reduce your plastic footprint, dumplings?